If something’s not floating your boat, rather than abandon it entirely, why not change it beyond recognition? You might not produce future garage, for example, but that doesn’t mean you can’t get something out of a genre-specific pack. So, whether you’ve starting a new track from scratch, or you just want to fill a couple of productive studio hours, in this tutorial, we’re going to show you how to generate true sonic inspiration from a deliberately restricted palette of samples. We’ll be using a selection of Loopmasters samples from the July edition of Computer Music, but you apply the same techniques to any samples you have to hand. Download the relevant files and audio examples for each tip by clicking here. Turn pretty much any uninspiring sample into a fresh sound by getting creative with your sampler’s looping functions. Having loaded the sample and enabled the looping, play notes on a MIDI keyboard while adjusting the loop start and end points until you find a loop that sounds good. Dialling in a little crossfade will minimise unwanted clicks and pops, and you can the sampler’s other features - filtering, modulation, etc - can be used to shape the sound even further. While this technique can be a winner for revamping any old sound, we’d particularly recommend trying it with tonal samples. Add instant credibility to a cheesy vocal loop by cutting it up into individual syllables and repeating them in a credible pattern of your choosing. By doing this, you can create a new and interesting vocal groove that fits any track like a glove. This technique can be applied either by slicing and arranging the audio directly on your DAW’s timeline or, for a less rigidly sequenced sound, triggering the slices in a sampler on the fly using a MIDI controller. Take a sound out of context by pitching it up or down by several octaves - this top technique can turn any sample into something more interesting. Step 1: First, we’ll make a rumbling cinematic drone for an intro section. Set your project tempo to 174bpm and import Backing.wav. Create a new MIDI track, load up a sampler and import Synth.wav. Draw two eight-bar C3 notes into a new MIDI region on bar 1 to trigger the sample. Step 2: Now, pitch both C3 notes down to C0 in your piano roll editor. You’ll hear the bright synth instantly transform into a menacing drone! Apply a 24dB high-pass filter at 40Hz to clean up low-frequency rumble. Next, create another MIDI track and load another sampler onto it. Step 3: Let's make a crash cymbal from a noise snippet that’s heavy in the low mids. Load Noise.wav into the new sampler and move the sample start to a point with a big transient spike. Trigger the sound with a high-pitched C7 MIDI note on bar 17. Heavy distortion and a reflection-heavy drum reverb completes the effect. Using drum loops from a sample pack can inspire the creation of fresh and interesting beats that don’t sound anything like the original samples. Start by importing a full drum loop at a different tempo to your track, then slice or stretch it to fit. After that, cut out the kick and snare so that you’re left with just the percussion hits playing. You can then build on this pattern with some genre-specific sounds of your choosing. If you’re producing in a four-to-the-floor style such as house, electro or techno, adding a cleverly edited breakbeat to the mix can work wonders. If your drums are in need of extra bounce, layering the looped first beat of a funk break behind the main kick and offbeat hi-hat can add realism and extra groove. Alternatively, a trap or grime percussion loop can make a fantastic 4/4 backbeat - with a little rearrangement, you can easily place the snare on beats 2 and 4 of each bar. If your DAW doesn’t offer extreme enough timestretching for your sound design needs, why not try a standalone freeware app such as Akaizer or Paulstretch? Akaizer is an unbeatable homage to old-school Akai sampler-style timestretching, while Paulstretch can turn even the shortest of one-shots into a never-ending drone. Most DAWs and tuning software such as Melodyne offer a super-handy Audio-to-MIDI function. This lets you extract the musical information from any piece of audio and turn it into MIDI data. The great benefit to creativity is that, once you’ve done this, you can use the MIDI as a starting point to layer complementary chords alongside a sample, add an extra musical element or reinforce the original chord’s missing frequencies. Not only is this a killer technique for quickly embellishing your track’s musical elements, but it’s also a winner for extracting cool riffs and chords from well-worn or clichéd samples. Unwanted noise can be the perfect starting point for unique sound design. If you’ve got a dusty breakbeat handy, the noise between each hit can be sliced out and turned into a new rhythm in its own right, or layered with a more digital drum break for added vibes. Another cool way to make something fresh from noise is to use a grimy vinyl crackle sample as a starting point. A click or pop can be easily turned into a 'drum' with some pitching, EQ and distortion. A quick way to give stock audio samples a creative twist is to reshape their pitch over time using your DAW’s built-in pitch envelope. This technique is great for giving sampled musical riffs a new lease of life - add faux portamento to pads, or interesting pitch modulations to static synth basses. As well as being able to create 808-style pitched bass drum samples from clean sine tones, you can also turn a long pad or drone into a great rise or fall effect, without having to synthesise your own - ideal for squeezing the absolute maximum out of your sample library. 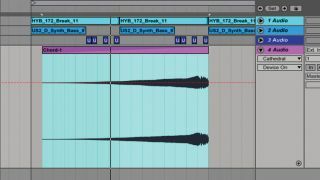 Making interesting variations on a short piece of audio can be difficult, but one technique that's always worth a try is pushing you DAW’s timestretching to its limit. By stretching a short sound to four, six or even ten times its original length, you can create a longer tone that will respond well to further processing - and if you want to stretch it even more, simply bounce and repeat! Experimenting with different timestretch modes is great for sound design, too - using a musical mode on drums can give a blunted, unusual sound, for example. TX16Wx is a free sampler with a mod matrix, looping and eight filter types - it's the perfect plugin for experimenting with creative sample modulation! Step 1: Set your project tempo to 172bpm and import Break.wav. Download TX16Wx, load it onto a MIDI track and import Bass.wav into the Keyboard Mapper. Set Range between C3 and C6, and Scale to Normal. Trigger it using Bass.mid. Step 2: Use the Mod Table (bottom right) to modulate the sampler’s Pitch with LFO1 - set the Amount to +350 Ct to give the bass a rising tone. Changing LFO1’s Mode to Tempo Sync gives the modulation a consistent feel. Now, set the Filter type to LowPass ready for more tweaking. Step 3: We’ll modulate the Filter Freq with Env1 using the Mod Matrix - set the Amount to -20000Hz. Now, adjust the Filter Cutoff to 3500Hz, and add 0.8 Drive for extra grunt. Finally, pull down Env1’s first point to -0.6 to give the bass a more defined, less ambient sound.